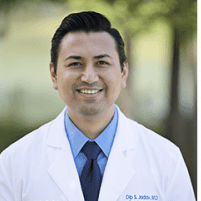 Testimonials & Reviews - Sugar Land, TX: Dip Jadav, M.D. Dr. Dip Jadav always appreciates feedback from his valued patients. To date, we’re thrilled to have collected 67 reviews with an average rating of 4.96 out of 5 stars. Please read what others are saying about Dr. Dip Jadav below, and as always, we would love to collect your feedback. I found everyone to be very professional and courteous, and I appreciated the fact that there was no long wait time experienced. My visit was pleasurable from the beginning. I was seen earlier than my appointment staff and was greeted by a very professional staff. The Doctor was no different-nice explained all tests well and extremely professional. Would highly recommend this practice to anyone. Dr Jadav and staff are wonderful. I couldn’t as for better care. Dr. Jadav and his staff are great. They are courteous and ensure their patients understand the treatments. I highly recommend Dr. Jadav. DR. JADAV AND HIS STAFF DO AN OUTSTANDING JOB. BOTH MY WIFE AND I ARE PATIENTS. WE APPRECIATE THE QUALITY SERVICE. Staff very friendly, physician very thorough. extremely personable. Very good experience, The Dr and all his staff are very good at their jobs, they are efficient and knowledgeable and have a great attitude. Wonderful overall place to go for eye care. Extremely impressed with my visit. He is highly trained. I would recommend to everyone. I have observed and been part of the front desk being very aggressive regarding collecting pre-payment before office visit. Otherwise very pleasant experience with Doctor and staff. Good service ! Doctor explained my results in a manner that I could understand. Exelent treatment doctor has exelent knowledge. Hi, All the staff members, front Desk, Eye exam, Surgery related info, Payment / Financial share etc, All the questions were addressed in the courteous, convincing Professional manner. Top of the line, Entry of Dr. DIP, Grretings with Big smile, sharing all the Surgery related info, giving necessary guidelines, addressing all the queries, timely communication with options, benefits etc. Hope to be COOL, HAPPY, & ENJOYING after the Cateract Surgery of both eyes. All the very Best to entire TEAM. My experience during the last visit on July 6 was excellent. I was taken good care of by Dr. Jadav and other technical and office staff. Every one of them was very kind and courteous, and the medical examination of my eyes was thorough with good advice on further steps I need to take. I will have no hesitation to recommmend Dr. Jadav for anyone who needs expert advice and care with opthomology. My experience was great and friendly. The doctor's pleasantries were also relaxing as were the office staff.